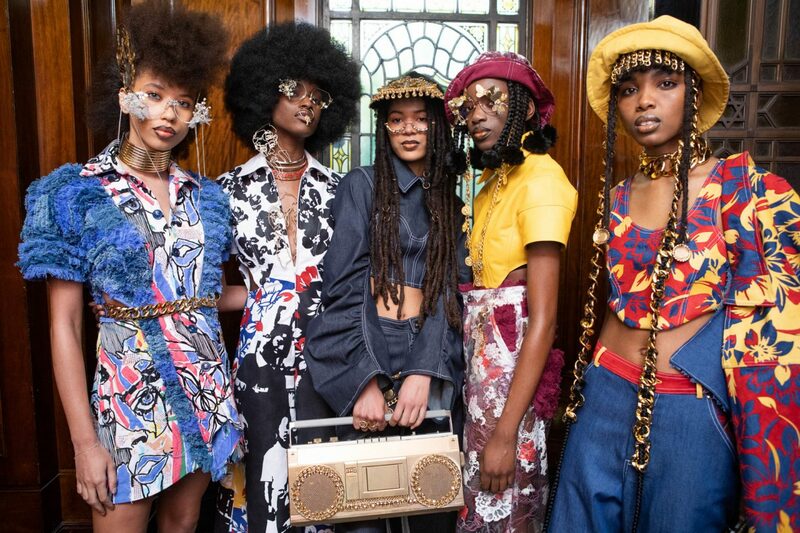 After the shows at London Fashion Week, I’ve rounded up the top nine emerging British fashion designers you need to know. Some of these designers were showing their debut collection whereas others are favourites I have written about previously. 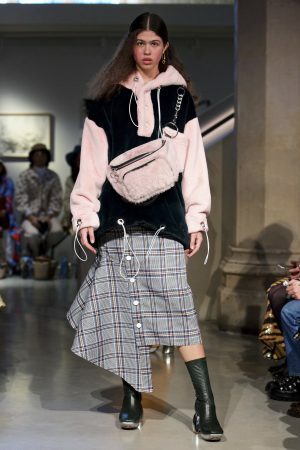 They all showcased exceptional AW19 collections and are ones to watch. Tolu Coker is a relatively new brand centred around inclusivity, diversity and social responsibility – very aligned with my key values. Winner of AW19’s Merit Award and joining illustrious alumni including Eudon Choi, Phoebe English and David Koma, Coker’s brand embraces her dual heritage and fuses her Nigerian and Western cultural references. Her AW19 collection is an ode to identity, drawing on deeply personal references including extracts from her father’s diary to old family Polaroids. Using innovative design techniques including traditional artisanal craftsmanship and modern technology, the collection explores the fluidity of navigating two cultures. Bold and beautiful, the collection uses reworked denim, recycled leather and reused plastic and lace scraps against a monochrome colour palette and stunning tribal prints. This is one of the most exciting British fashion designers I have seen this season and I cannot wait to see what Tolu has in store for next season. I always look forward to VIN + OMI‘s show at LFW. The eco-friendly British fashion designers always presents an incredibly rebellious and rambunctious collection which is underpinned by groundbreaking eco-friendly and sustainable initiatives. They have produced 16 new eco-textiles with social impact projects at their heart. SS19’s collection, titled Planet Rewind, is no different. The design duo worked with 22 clean up projects to collect plastic from around the UK which was then turned into VIN + OMI’s rPET fabric, which makes up the majority of the collection. The collection included metallic flowers made from recycled metal cans as part of their ‘Can to Catwalk’ project, which supports Birmingham homeless charities. It also features an array of plant-based fabrics, hand woven hybrids of linen, nettle and cow parsley grown in the English countryside. In the current bleak political and environmental climate, Vin + Omi provide a much-needed beacon of hope. One of London’s most promising British fashion design talents, Gayeon Lee is a name to remember. With an MA from Central Saint Martins and a stint at Marc Jacobs alongside numerous awards, Lee is at the beginning of a very bright future. 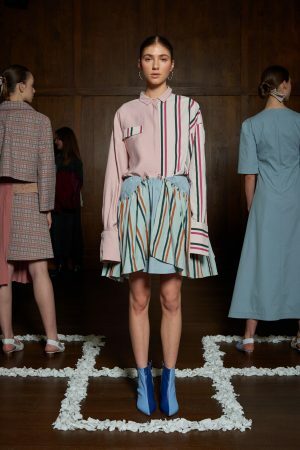 This was more than evident in her AW19 collection, a polished capsule of beautifully tailored pastel pieces with sharp pleated detailing. Sleek, straightforward silhouettes were manipulated with pleating and layers resulting in an elegant yet powerful collection. One of my favourite things about London Fashion Week is that it’s an incubator of emerging talent. I love discovering a new designer and following their evolution. 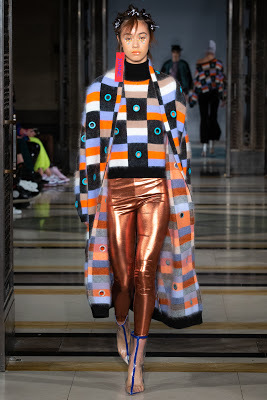 I have long been a fan of Jayne Pierson’s directional take on womenswear but her AW19 collection is truly exceptional. The collection explores the rebellion of modern women, who no longer wish to conform to what is expected of her, instead, she wants to reveal her true self and inner aspirations. Pieces adorned with seemingly random doodles and scribbles, symbolising the overspilling of a modern women’s inner self, which she wears boldly as an armour celebrating her individuality. Also inspired by reappropriation, silhouettes are inspired by the process of reclaiming artefacts. 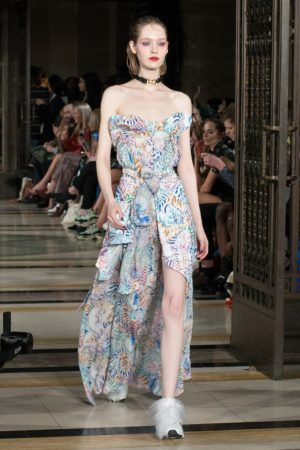 This season marked Chinese knitwear designer Liu Yanjun’s London Fashion Week debut. Already renowned in China, receiving a coveted cosign from Vogue China’s EIC Angelica Chang, JUNNE is known for taking a single piece of yarn and transforming it into directional knitwear pieces. This season Lau is inspired by the brilliant Frida Kahlo and she takes several signature elements and weaves them into her knitwear collection. Skeletons are a prominent feature, Lau uses 2D texture and 3D shapes to create bone-like texture in several of her pieces. The collection also uses hardware features to represent restraint and pain, one of the standout pieces being tops pierced with a plethora of pins. 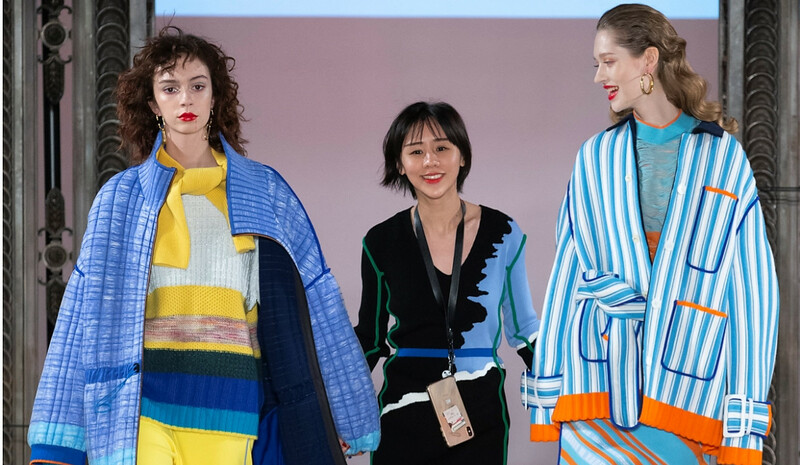 Another knitwear brand, London-based I Am Chen is known for fun, lighthearted knits and is one of the current finalists for the International Woolmark Prize. Designer Zhi Chen’s AW19 collection draws on her engineering background with grids and lines having prominence in her pieces. Also inspired by American abstract painter Agnes Martin, the collection channels abstract expressionism with a minimalist edge. Another utterly fantastic collection from Chen, who constantly pushes the boundaries of knitwear to create new fabrics and techniques. 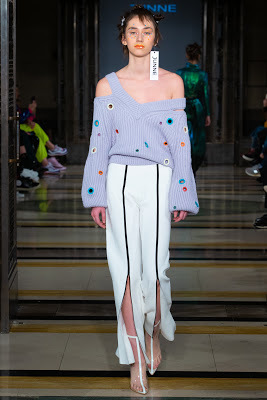 Kalissi’s AW19 collection was one of my highlights of LFW. Titled Roial, it draws heavy inspiration from the super-opulent Austrian imperialist period, Kaiserlich and Konglish. Sumptuous, lavish detailing including pearls and ruffles are scattered throughout the collection. The collection juxtaposes its aristocratic inspiration with contemporary silhouettes and colours to create playful, multi-dimensional pieces which as just, well, fun. A collection of statement pieces, including a stunning doll-like look with an exaggerated rounded silhouette, these pieces are definitely for extroverts. If Gossip Girl was to have a very premature 2019 reboot, I could see Blair Waldorf wearing several Kalissi pieces. Jamie Wei Huang is one of my fashion week favourites, I usually adore her collection and always pop into her Paris showroom to see it up close IRL. Her AW19 collection is no different. 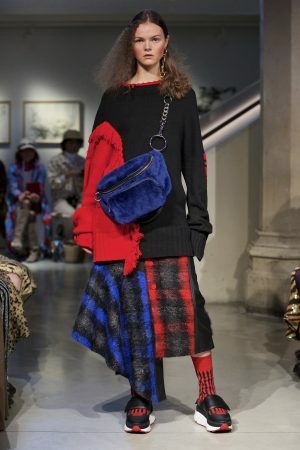 Her signature oversized, deconstructed aesthetic and bold colour palette is updated for next season, inspired by a song by a Taiwanese indie band. Graphic lines and tartans dominate the collection, which leans heavily into a rebellious school vibe. Uneven hemlines, sharply tailored blazers and huge oversized waist bags punctuate this gorgeous collection. Inspired by the work of artist Tim Braden, this season sees Cassey Gan experimenting. Using a variety of materials and colours she hasn’t used before, the AW19 collection is a riot of prints and vivid brushstrokes. 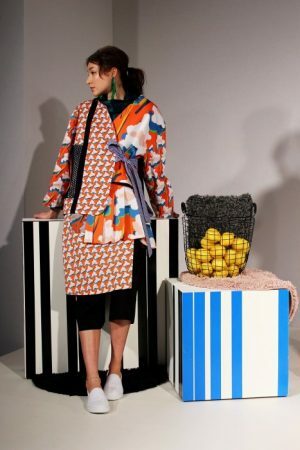 Punchy oranges, regal blues, zingy lemons and rich reds highlight the creative silhouettes and pieces which are layered up to showcase a clash of textures from soft knits, thick tweeds, quilts and mesh. Fast becoming one of my favourite designers, I adore this collection from Gan.